I used to try to read everything I could on nutrition because I was always chasing the next best thing. I was always on the search for that one nutrition tip that was going to change everything. What did I learn and get from that? A whole bunch of wasted time, more confusion, and I was nowhere closer to achieving food peace. At around the same time, I slowly began my minimalist journey (which I’m still on today). It’s one tool I used to free myself from constant information and product consumption and clutter. It’s about making decisions of purchase more consciously, deliberately, and intentionally. 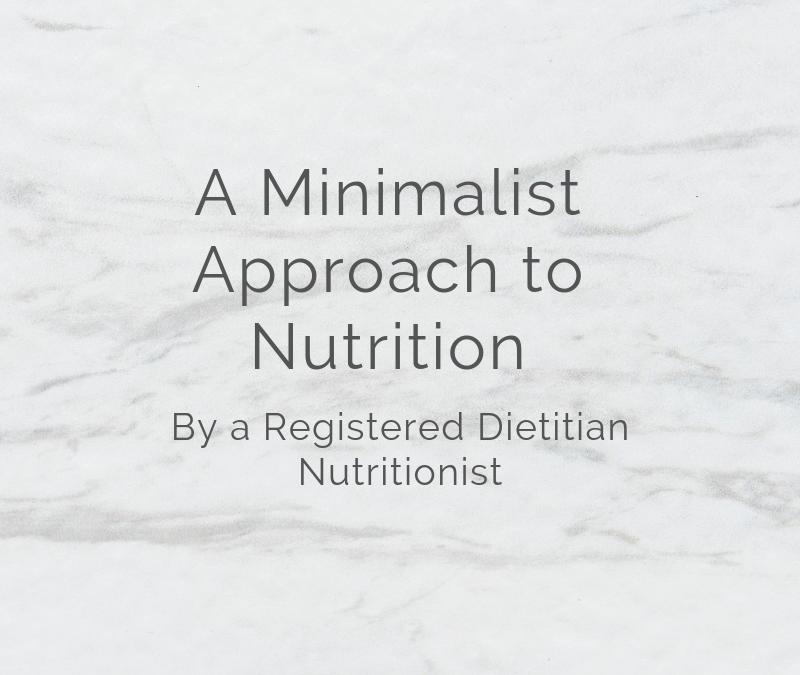 And while minimalism is often centered on how we approach physical purchases and clutter, it can be a really great and balanced way of applying it to our nutrition. Having less clutter (physical and mental) around helps us to better focus on life values and goals. This is one of the reasons why I make nutrition as simple as I can to keep mental clutter to a minimum. I still own a lot more physical stuff than what some might consider minimalist, but I’m on my journey and slowly but surely reaping the benefits of less clutter. So how does this relate to nutrition? Remember, it’s the intentional promotion of things we value. I recently wrote out some of my life values and saw just how much it falls in line with my approach to my own nutrition and nutrition coaching and how it’s evolved throughout the years. So I wanted to share to encourage you to reflect on your own life values, and maybe encourage you to take some different nutrition approaches and strategies that may be helpful as they fall in line with your values. I like to keep my life as simple as I can. Simple does not mean boring, but instead uncomplicated and straightforward. Keeping as much as I can simple means that I can spend my brainpower on more important things that require more energy. Decision fatigue is a real thing, and spending tons of energy on food choices is not how I want to live. I coach people to build meals with a foundation of meal components (pairing a protein, fat, and carbs) at each meal. This not only keeps us satisfied, but also keeps decisions to a minimum, with the option of always making it more complex. I want the relationships in my life to be of high quality. And I want to show up for people in the best way I can. Quality food means having food that is good and nutritious for the body so we can live healthier versions of ourselves. It’s about understanding food ingredients and how they affect our body, hormones, and ultimately the impact they have on our quality of life. You could take this as being sure your foods are grown and produced in a sustainable way, which is super important! But I’m mostly talking about food habits that can be maintained long-term; choices that are consistent. It doesn’t matter what your nutrition plan is if it’s not something you can realistically do long enough to make lasting change. This one’s my favorite. There’s no expectation or need for perfection when making nutrition changes. Grace is not the same thing as letting yourself go. Quite the contrary – it’s something challenging to do. It’s about shedding the guilt and shame that comes from not living up to your ideal standards 100% of the time, while still being able to move towards your goals. You can still try your best, but stop beating yourself up for being a human being. These all fit in the same category to me. As I mentioned earlier, nutrition and food doesn’t have to be boring. I approach my food with variety, lots of seasonings, and always love trying out new foods – and I encourage my clients to do the same. When food becomes a boring chore, something’s not right. We are allowed to have fun with our foods and unleash our creativity around it. I want foods that make me feel good – food that brings me joy. Having a minimalist approach to nutrition to me means that you are choosing foods that add value and vitality your life. It requires intentional thought. It’s about not allowing excess stuff to get in the way in your pursuit of the more important things in life. If your food choices are consistently keeping you from being and feeling strong and active, chances are that having a more intentional approach would be beneficial – whatever that needs to look like for you and your current stage of life. Choosing to focus on all the details in a nutrition plan and not see the whole picture is like missing the forest for the trees. Having a more simple, minimal approach, worked through and tailored for you with the help of a good nutrition coach is a way to put you on track to living a value-driven life and is helpful when trying to implement changes that will keep you seeing on long-term success (whether that’s performance, health, weight, etc). To get a free copy of my minimalist foundation and free 3 day simple, balanced meal plan click here. While you’re at it, let’s keep the conversation going. If you’re a minimalist, or aspiring one, have your nutrition habits changed?